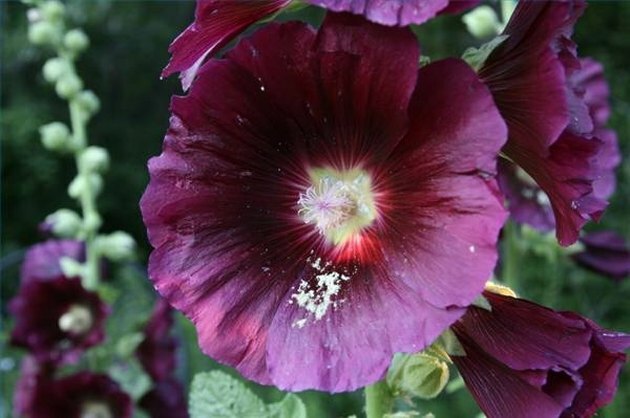 The Hollyhock is a long-blooming summer favorite. It graces gardens throughout the United States and in other countries. It can be found in borders, as ornamental, mass plantings and even as cut flowers. This stately plant provides architecture to the garden plus a wide range of colors from pastels to vibrant hues. Hollyhock, Alcea rosea, is a summer blooming biennial that has an upright habit with thick sturdy stems. They are winter hardy to zone 3. Zones 3 to 8 begin blooming mid to late summer. In zones 9 to 10, young plants are set out in fall and bloom early spring through summer. Hollyhocks are drought-resistant. Hollyhocks require full sun for most of the day. They grow best with good drainage in a medium fertile soil. They also grow well in clay soil, but do not grow well in a soil that is too rich. Lots of room is needed. Space plants 3 feet apart. Staking is required and cultivars can reach heights of 2 to 9 feet. This is a winter hardy plant that zones 6 or below should winter mulch to protect dormant buds. They come in a variety of colors from whites, yellows, pinks, reds, lavender to midnight purple almost black. Blossoms are 2 to 5 inches across. Blooms start at the bottom of the stem and spiral upward. It is a repeat bloomer, providing color all summer season. For more flowering stalks, pinch out the growing tips once or twice early in the season. This will result in shorter plants with more flowering stalks. They are drought-tolerant, but bloom better in moist soil. This cottage garden staple is a long-blooming flower originating in China. Chinese gardeners cooked the greens and the buds were considered a delicacy. Arriving in America in 1630, double blooming types were found in 1677, and were followed by striped varieties in 1823. Today, varieties can be fringed or ruffled. Thomas Jefferson cultivated Alcea rosea var. nigra, a dark purple variety. Hollyhocks are still grown at Monticello and thought to be its descendants. Rhonda Pennington has written personally and professionally for more than 30 years. She is a public school principal and has worked as Professional Development and Integrated Media Initiatives Coordinator for the National Middle School Association. Current projects include a gender education book. Pennington has a Bachelor of Science in education and a Master of Education Administration. What Flowers Can Be Planted in July?